Miami Trace fifth grade essay winners for the the D.A.R.E. essay contest. Fifth graders celebrated their graduation in the cafeteria with Giovanni’s pizza and their awards ceremony. Fayette County Sheriff’s Office Deputy Monty Coe and Fayette County Sheriff Vernon Stanforth hand out certificates to the graduates. 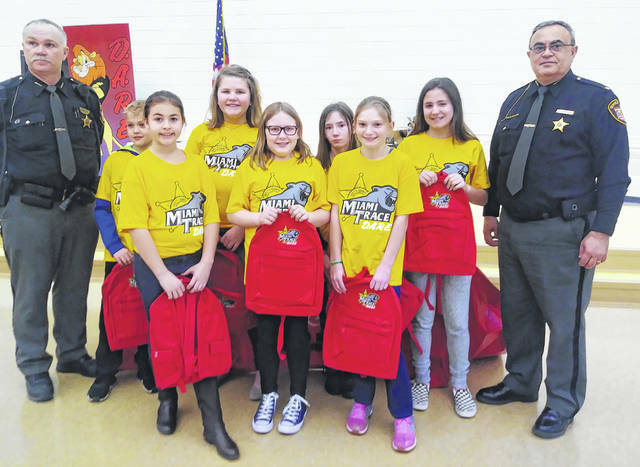 Fifth graders at Miami Trace Elementary School celebrated their graduation from D.A.R.E. on Wednesday. D.A.R.E. stands for Drug Abuse Resistance Education. The purpose of the program is to help kids gain the awareness and skills to avoid involvement with drugs, gangs and violence. Initially founded in 1983 in Los Angeles, D.A.R.E. has become so successful it is now implemented in 75 percent of the nation’s school districts and over 52 countries. More information can be found at dare.org. Fayette County Sheriff’s Office Deputy Monty Coe is the D.A.R.E. officer for Miami Trace Elementary as well as their school resource officer. 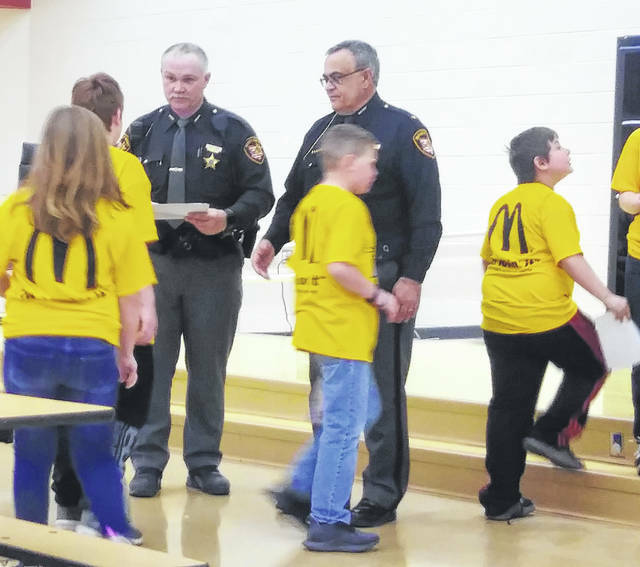 Coe, along with Fayette County Sheriff Vernon Stanforth and several other members of the sheriff’s office, joined the fifth graders for their celebration. They had lunch, courtesy of Giovanni’s Pizza. 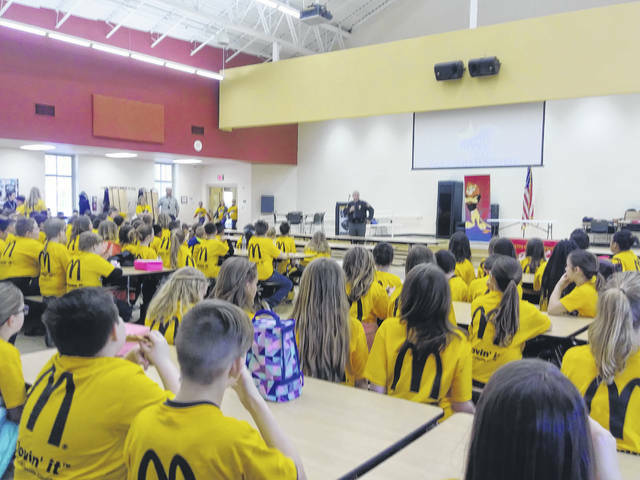 The graduates wore matching shirts that were sponsored by McDonald’s of Fayette County. Each graduate received a certificate to showcase their achievement. Gabby Matthews won first place and received a bike as a reward. Other essay winners received a red backpack with the Miami Trace logo. Those winners included Elizabeth Watson, Nevaeh Toles, Charlie Worley, Brooklyn Radcliff, Tori Johnson, Grace Green, Andrea Zunin and Adrienne Jacobson. The graduates received their certificates by home room. Their teachers took turns reading off their names. Teachers involved included Mrs. Honda, Klontz, McCarty, Arthur, Sweeney, Ford, Trimble, Schingledecker and McClaskey. Miami Trace Elementary Principal Ryan Davis said, “The kids love it. I think the community appreciates it.” Davis was bopping around the cafeteria throughout lunch and the award ceremony with a smile for every child and teacher in attendance. https://www.recordherald.com/wp-content/uploads/sites/27/2019/03/web1_Essay-winners.jpgMiami Trace fifth grade essay winners for the the D.A.R.E. essay contest. https://www.recordherald.com/wp-content/uploads/sites/27/2019/03/web1_20190320_125932.jpgFifth graders celebrated their graduation in the cafeteria with Giovanni’s pizza and their awards ceremony. https://www.recordherald.com/wp-content/uploads/sites/27/2019/03/web1_20190320_131053.jpgFayette County Sheriff’s Office Deputy Monty Coe and Fayette County Sheriff Vernon Stanforth hand out certificates to the graduates.